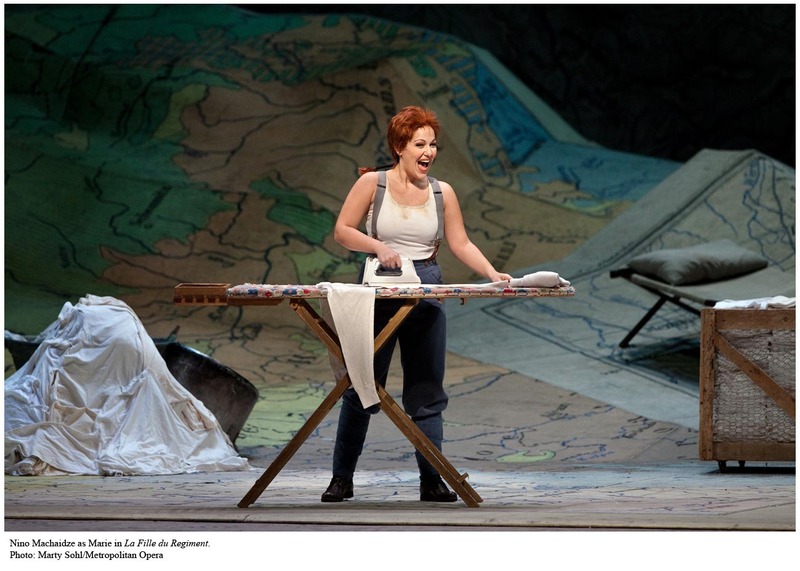 Laurent Pelly’s whimsical production of Donizetti’s fluffy La fille du régiment is impossible to dislike. I unexpectedly went to the last performance of its current Met run last night and was again charmed. The plot of an army mascot in love and her many protective parents (both the entire regiment and her newly-rediscovered blood relations) is sweet, the music is bouncy and tuneful, and the characters are so good-hearted and adorable that they remain likeable through the heavy layer of schtick conferred by Pelly’s production. When I saw the premiere cast in 2008, I found the show a little on the slick side (here is my review from back when I was a baby blogger), but this time I think it’s a winner through and through. The choreography keeps things cute and fast-paced, and the gags work, but Pelly never forgets to use them to define the characters first–when the haughty Marquise de Berkenfield thinks the praying peasants are saluting her, or when Marie bounces onstage wearing suspenders. The set of maps is vaguely representational and fills the stage, everyone dances periodically, and the soldiers are the most harmless lot you’ve ever seen. Lord knows what war figures in this slightly updated production, but does anyone really care? Unlike the premiere’s Natalie Dessay and Juan Diego Flórez, the current cast doesn’t have the slightly empty look of people who have rehearsed very, very well, and they are a little more sincere. That’s a gain, but unfortunately the same star power just isn’t there. Nino Machaidze sang serviceably, but her laser-bright tone was unvaryingly loud and she lacks the agility to make the coloratura sparkle rather than just come out. Her Marie doesn’t have the quicksilver gamine quality of Dessay, but her more forceful, brassy acting worked well too. If only her spoken dialogue had resembled French. 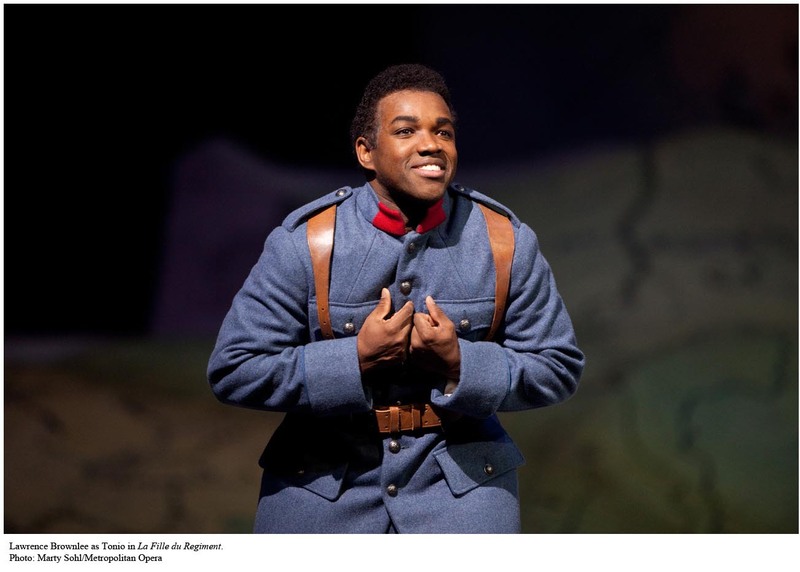 * Lawrence Brownlee made a suitably adorable and boyish Tonio and his warm and round sound has more appeal than Juan Diego Flórez’s, though he lacks some of the latter’s charisma–his final entrance on a tank in particular just didn’t have that incredible sense of ridiculous triumph. I’ve never really understood the appeal of the famous string of high C’s in “Pour mon âme” (when it comes to extreme tenoring, give me a good “Vittoria!” any day**), but Brownlee dispatched them with élan. Elsewhere, Ann Murray was hilarious as the Marquise of Berkenfeld, though her voice is showing its age and is very uneven. Maurizio Muraro was an amiable Suplice. Kiri Te Kanawa displayed her underrated comic skills as the Duchess of Krakentorp and still sounded like herself in an aria from “Le villi”. I missed Marian Seldes’s “he’s on the bobsled team!” line, though. The orchestra and Yves Abel got off to a rough start in the overture, with a lone violinist coming in smack in the middle of a dramatic pause and some other coordination issues, but the rest proceeded smoothly enough. Between this and today’s webcast of L’elisir d’amore from Munich (in David Bösch’s surprisingly poignant production), it’s the Weekend of Adorable Donizetti, apparently. *However I do recommend her Lobiani recipe in Die Oper kocht. It is excellent. **After writing this I went back and looked at my review of the premiere cast and I said just about the exact same thing. At least I’m consistent! The uniforms firmly fix it as WW1; specifically 1915 on. There's irony (as opposed to ironing) for you. I saw this production in SF with JDF and the wonderful Diana Damrau, so there was plenty of chemistry. I love the production – adorable and very charming, as you say. operaramblings: ah, yes, something made me think like a decade earlier than that but maybe it was just my continued inability to reconcile "World War I" and "comedy." Between this and Faust, the Met seems to be cornering the market in this, though. Lisa: Damrau has sung it at the Met too, but I missed her! I have to say, Brownlee and Machiadze weren't really happening on the chemistry front. I have to say that it is possible to dislike this production. 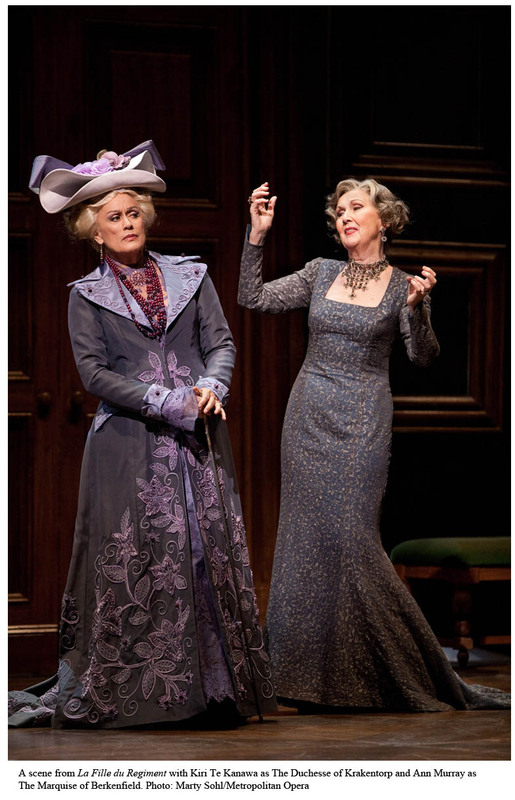 I did did not see the current revival but saw it when it was originally done at the Met. I thought it was ugly in the extreme and too hyper–I was dying for someone to just stand and sing for a while–yes it made me wish for park and bark. BTW what are French troops doing in the Alps during WWI? Which was another problem. I am sure the Battle of Moreno was no day at the beach and it was probably still fresh in the minds of the French audience at the opera's premiere but watching this comedy all I could think of were the horrors of the trench warfare of WWI. I beleive in an interview in Opera News Pelly said that he thought Fille was not funny–well he made sure of that with this production.